The lead up to the first downunder concert in 17 years was met with a buzz to say the least. The city of Wellington (which had already delighted in winning the location over Auckland) was widely promoted across New Zealand as the concert centre. 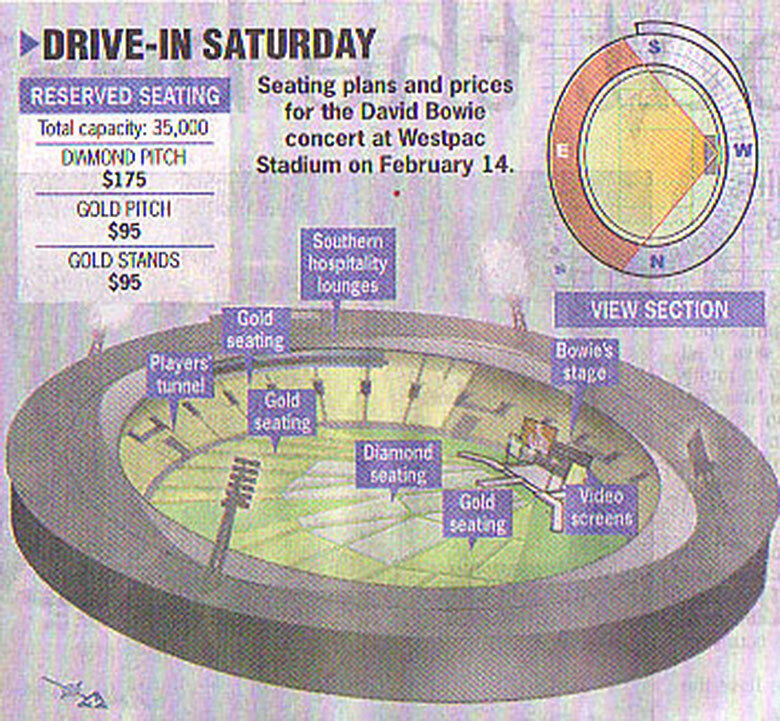 The chosen venue - Westpac Trust Stadium - indicated that Bowie and his promoter had confidence in drawing a very large crowd and this particular concert was set to be Bowie's biggest audience for a singular billed show in over 10 years. 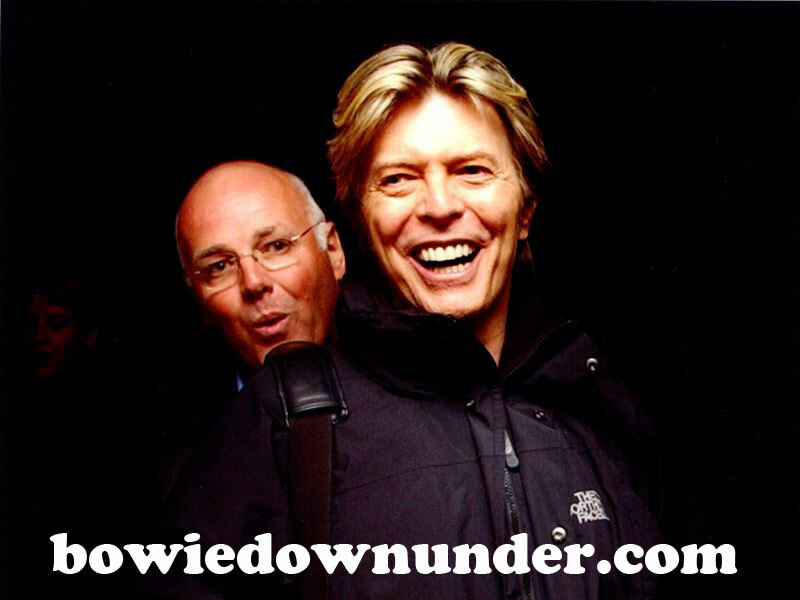 To start the ball rolling, in December 2003 Bowie set a national record for internet sales - outselling Springsteen, Robbie Williams and all other artists who had toured the nation previously. 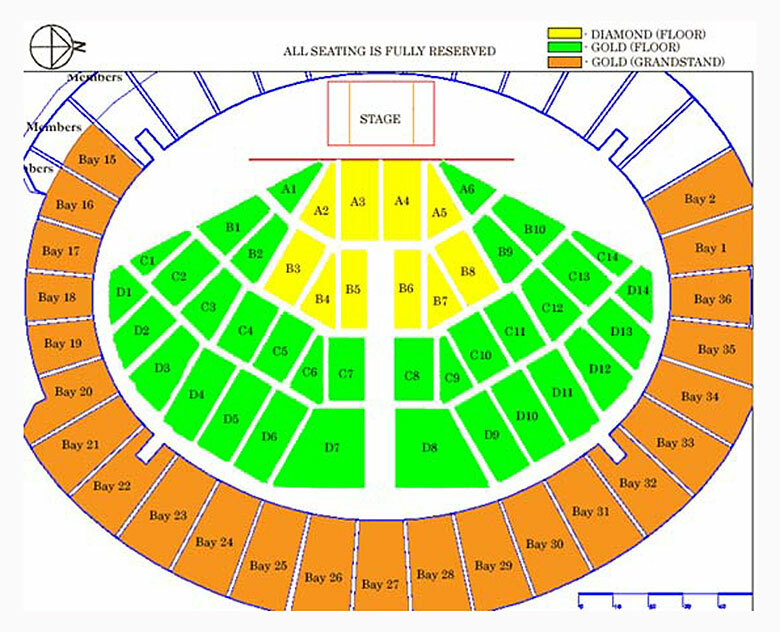 The selected stadium was primarily a venue for New Zealand football and it was carefully divided up between Gold ($99) seating both in the stands and on the playing surface as well as Diamond ($175) for the choice seating near the stage. With the stage facing to the east side of the stadium and the seating in front, the usual capacity was reduced from approx. 38000 to 28000 for the event. 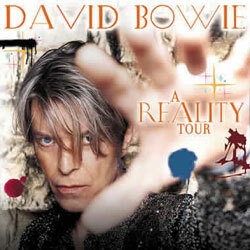 In the days leading up to the event, numerous Bowie fans descended upon the capital city. 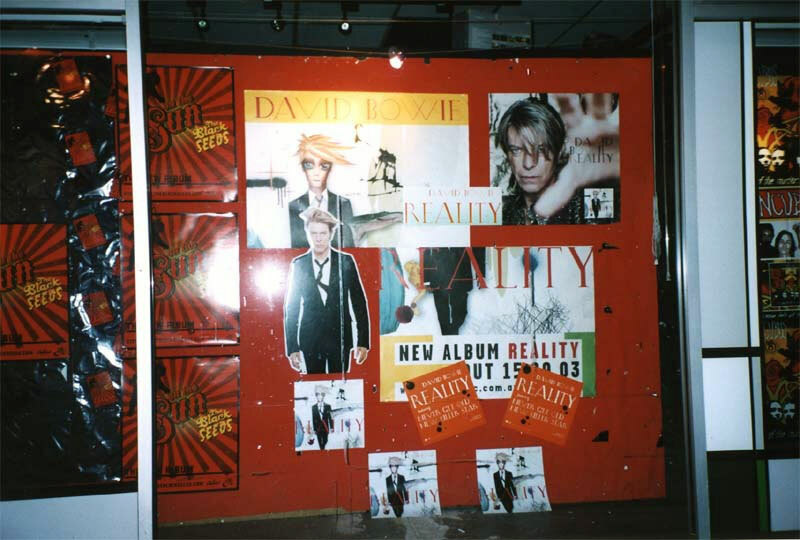 Concurrently, music stores became stocked with Bowie albums and displays, articles appeared in newspapers and billboards were seen everywhere. Most accommodation in the city was sold out well over a month before. Music Store Display, Wellington Feb 12. 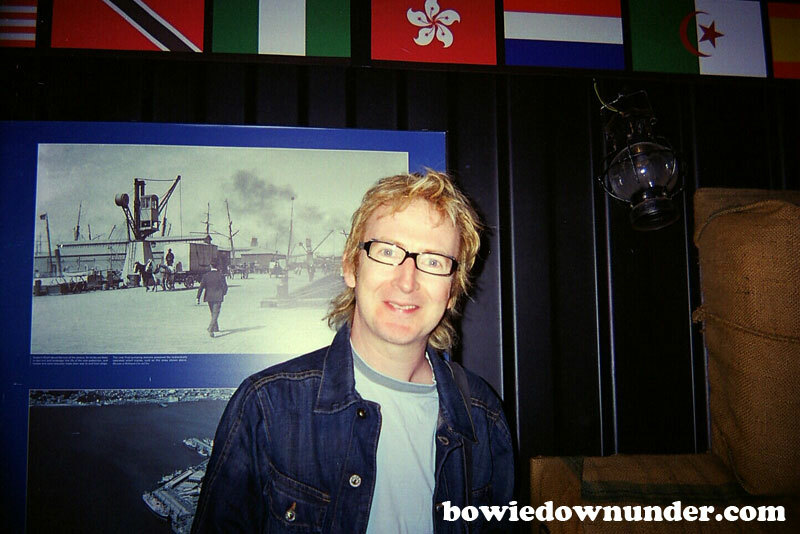 A "David Bowie Holiday" to Wellington 2004. Gullivers in conjunction with Qantas. 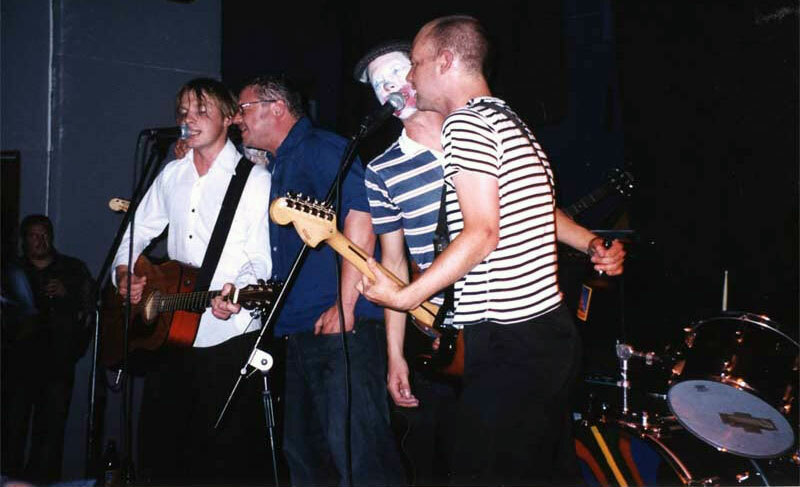 On the night before the concert - February 13, several fans witnessed 'The Spiders from Mars Bars Band' - a band of locals who came together for the occasion. 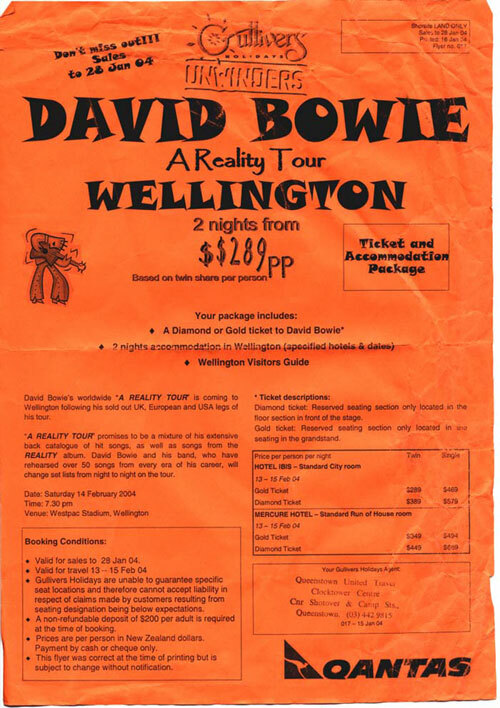 For many attendees, it was the only live Bowie event they'd experience as ticket prices for the main show were out of the range of affordability. 'The Spiders from Mars Bars Band' played some Bowie classics before culminating in a extended psychedelic version of 'Magic Dance'. The Spiders from Mars Bars Band, Wellington Feb 13, 2004. Photo by Adam D.
Later that evening back in Courtenay Place, people were seen busking, singing and literally dancing in the streets to Bowie. One busker worked up a crowd with a bluesy impression of 'The Jean Genie' played on electric guitar. 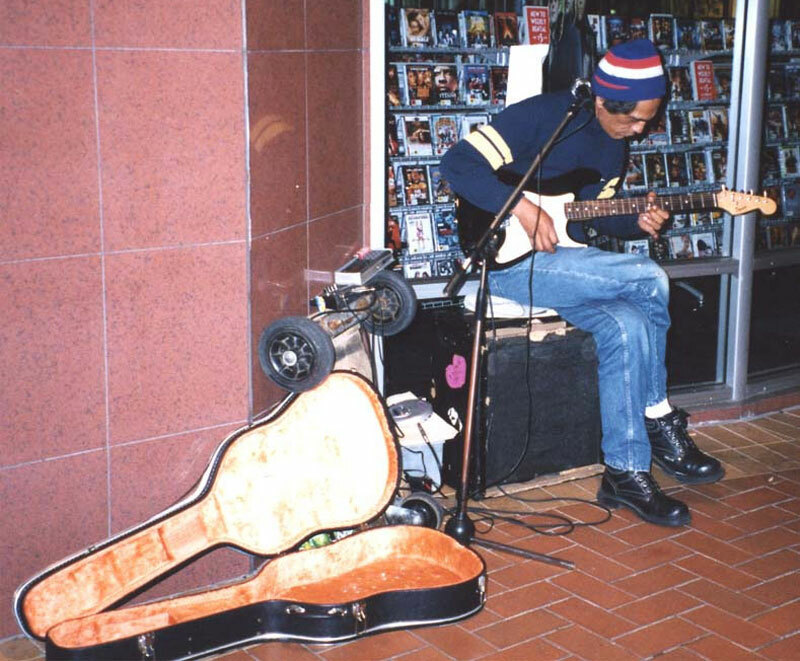 Busker doing the Jean Genie, Courtenay Place, Wellington Feb 13, 2004. Photo by Adam D.
"Every store was playing Bowie all day; the bars and restaurants were packed and the Air New Zealand trolleydolley sang Space Oddity as our plane landed on Friday." Music Store Shopfront, Wellington Feb 13, 2004. 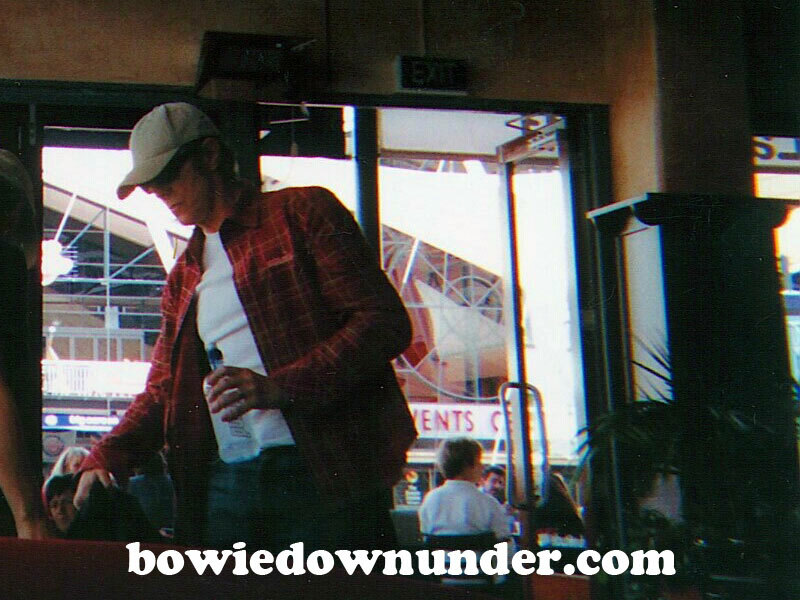 As for David Bowie, he kept a low profile in the days leading up to the concert. He was at one point seen in Wellington's Lambton Quay area. Photos by TJNWorldEnterprises. 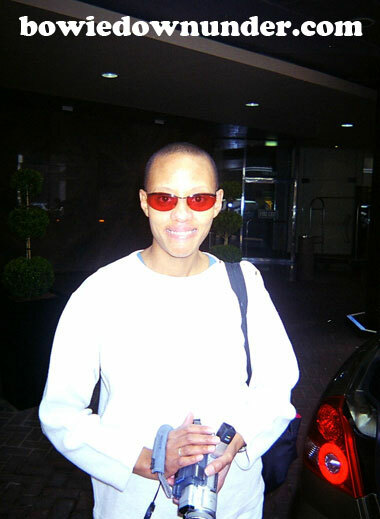 Gerry Leonard (guitarist) and Gail Ann Dorsey (bassist) in Wellington. 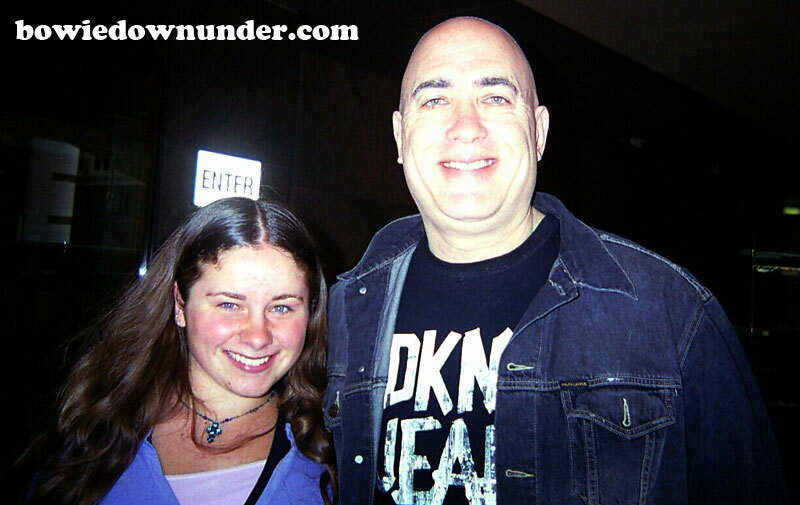 Photo by TJNWorldEnterprises.Mike Garson (keyboardist) in Wellington. 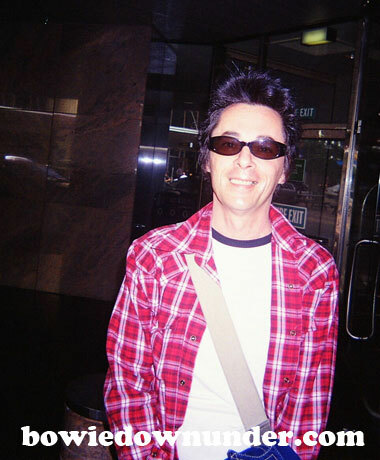 Wellington 2004. Photos by TJNWorldEnterprises. 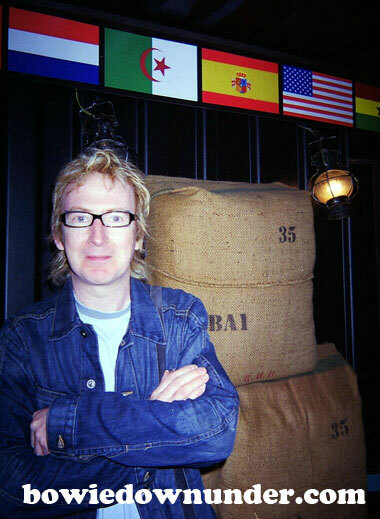 Gerry Leonard in Wellington. Photos by TJNWorldEnterprises. 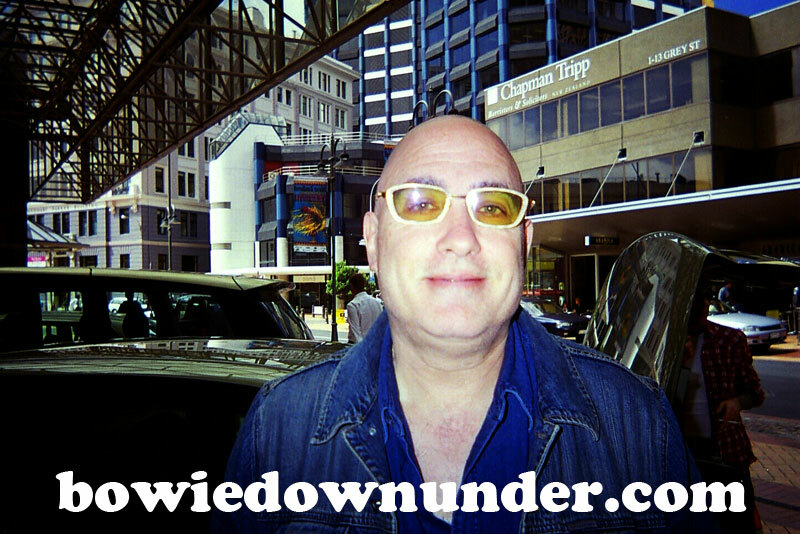 Mike Garson (keyboardist) in Wellington. Photo by TJNWorldEnterprises. 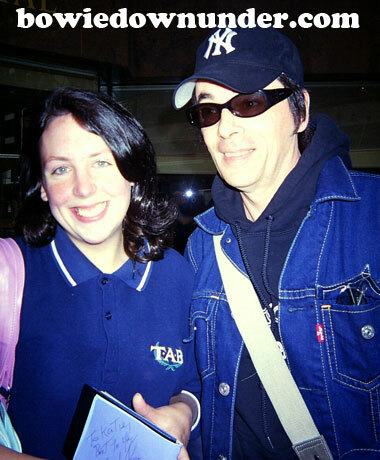 Wellington 2004. Photo sent in by TJNWorldEnterprises. 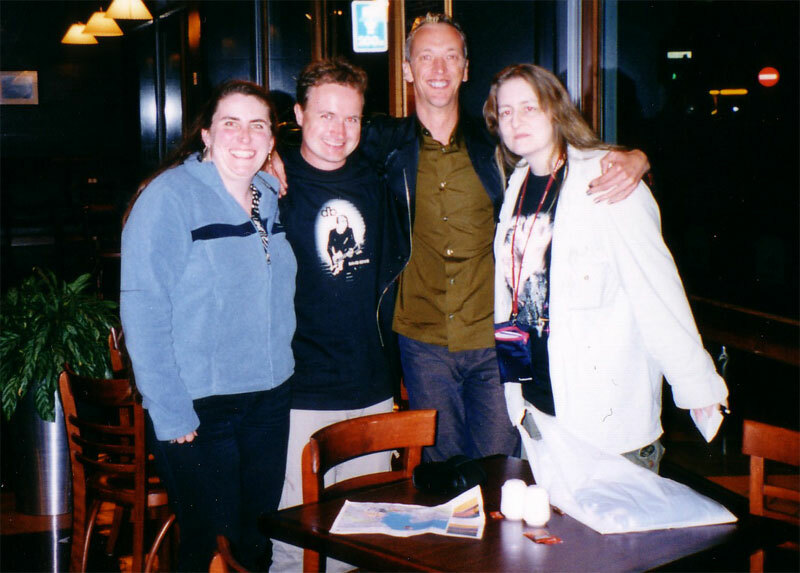 Finally on the evening of the big event, Ferryman's Bar became host to the first Bowie Downunder meet up in New Zealand. 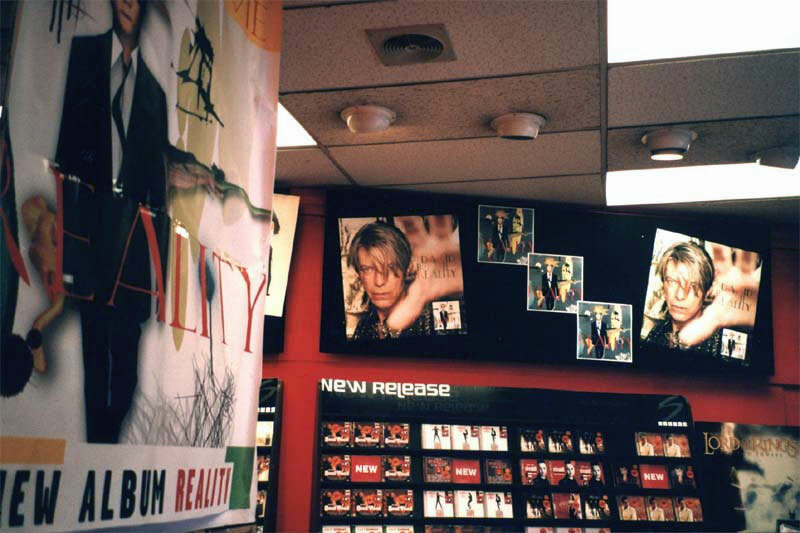 From 4:30 PM, The Best of Bowie DVD began playing to a small band of unsuspecting regulars. 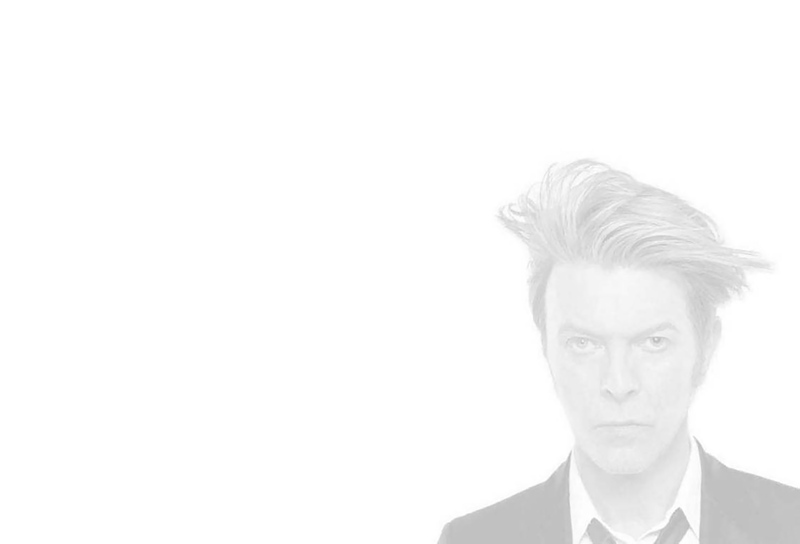 As Bowie fans arrived, the focus turned to the huge event that was only hours away. Anna - who arrived in from Christchurch, recalled her Air New Zealand flight announcement which was to 'enjoy the Bowie concert'. This apparently followed by three quarters of the passengers applauding. Mike, Anna, Adam, Rachel and Isabel. 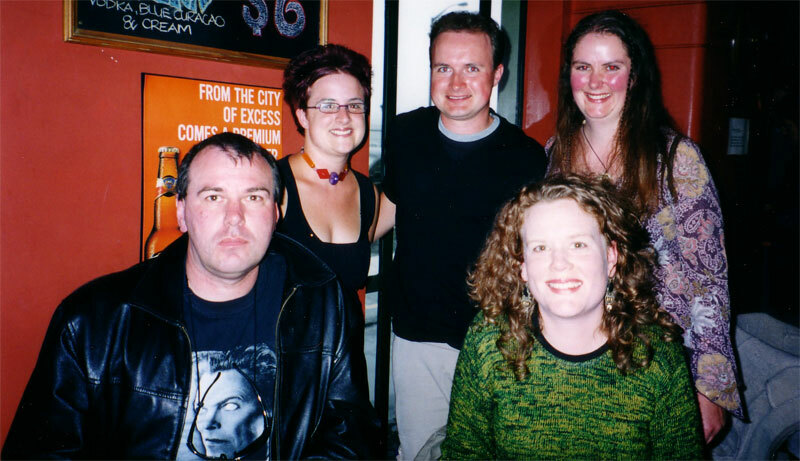 A number of other fans (Louise, Shane, Kristen and her brother Paul) had just finished interviews for TV NZ whilst Mike Harvey (webmaster of the Ziggy Stardust Companion) had been featured in the local print media. Meanwhile, as the rain pelted down outside, the fans never blinked an eyelid. The anticipation of the first downunder concert in 17 years (albeit an outdoor one) was enough to kill any real concerns about the weather. Louise, Adam, Shane and Charly. Bowie fans at Ferryman's Bar. NEXT PAGE: The First Downunder Concert in over 16 years!